Thank you for attending the Getty Music Worship Summit! As our way of saying thanks, we wanted to extend to you the SPECIAL OFFERS mentioned at the event. We hope these will be an encouragement to you and your congregation during the Christmas season. "Sing! 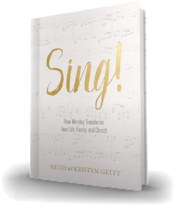 How Worship Transforms Individuals, Families and Churches"
This book expands on the great teaching you heard at the leadership event and makes a great gift for choirs, worship teams, your church staff or the whole congregation. Join thousands of pastors, musicians and church leaders for the Getty Music Worship Conference: Sing! 2018 Sept. 10-12. Featuring John Piper, John MacArthur, Alistair Begg, Tim Keller, Ravi Zacharias, Sally Lloyd Jones, Trip Lee, Stuart Townend and over 30 additional speakers, this conference is designed to encourage churches towards a deeper, more dynamic view of theology, artistry and mission in congregational singing. Sign up at www.gettymusicworshipconference.com before January 31 to take advantage of early-bird savings! DOWNLOAD FREE MODERN-HYMNS FOR YOUR CHURCH IN 2018! CLICK TO DOWNLOAD "THE LORD IS MY SALVATION"
CLICK TO DOWNLOAD "LIFT HIGH THE NAME OF JESUS"
For more great resources from the Gettys, please visit our NEW webstore and take advantage of our biggest sale ever!